This is a post about 2 of Asher Benjamin's pattern books: The American Builder's Companion and The Architect, or Practical House Carpenter. I like reading Asher Benjamin's pattern books. This is a real person. He writes for "all practical house carpenters... particularly those who reside in the country, where they have no opportunity of consulting with an architect." *2 He is talking directly to them. My friends have just bought a farm with fields, barns - and an old house - in Ohio They have many questions. The land was first settled in 1805. The house may have been built soon after that. Its shape and proportions are Federal: center entrance, 2 windows each side, 5 above, end chimneys. Since Benjamin's pattern books were used extensively as guides by house wrights and joiners in the states west of the Appalachians from before 1800 through the 1860's, I mailed my friends two of his pattern books for their use: The American Builder's Companion, first published in 1806, the 6th edition (which I sent) in 1827, and The Architect, or Practical House Carpenter, published in 1830, and reprinted through 1850. This post is an addendum to the books - to help them discover Asher Benjamin's writing for themselves, especially since I live so far away. I also wanted my friends to see how design and construction techniques evolved in those years and how to read them in their new house. 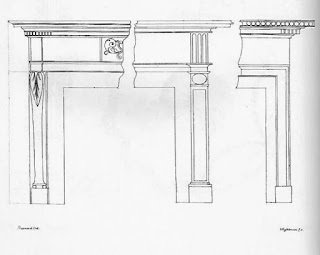 The mantle - called a 'Chimney Piece' by Asher Benjamin - has only proportions - barely any moldings, no pattern, no emphasis or flourish. 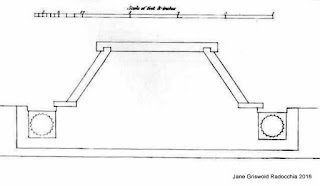 Those proportions, however, are closely aligned with the shape of the mantle - illustrated in Plate 37 of The American Builder's Companion (shown here). The shelf is narrow and extended on the ends; the board below it is wide; the side pieces are topped with a bead so that they read as columns. It is as if the joiner created a background, a base ready for embellishment. This would seem to imply that the chimney piece was built before 1830, following the late Georgian style. This style is often referred to as Federal, Adamesque, or Neo-Classical by historians, but also called 'Colonial' by many. But... What often happened was that the joiner simply copied what he remembered from where he came from - which might have been 30 years ago. Unless someone signed and dated his work, the age of a piece cannot be easily pinned down. 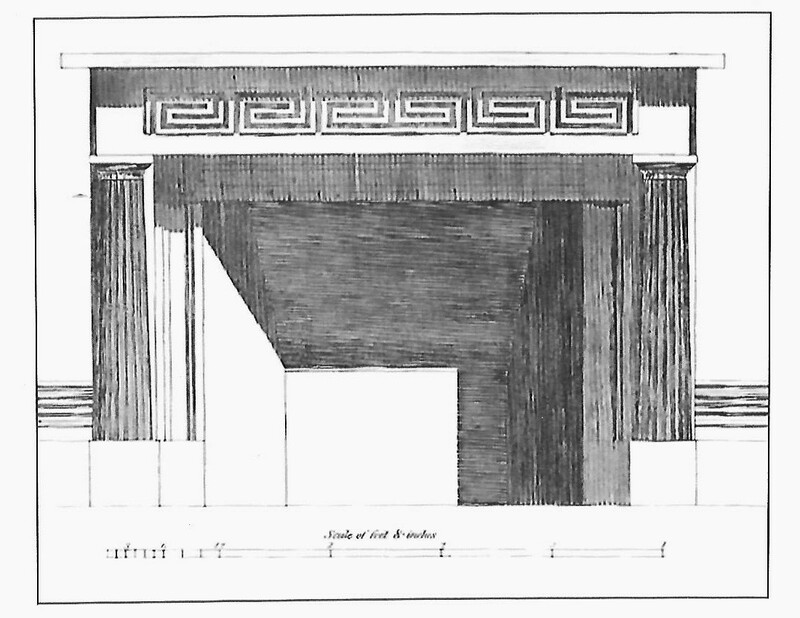 Still, the joiner who built the mantel in my friends' house did not know or disdained this mantle illustrated in Benjamin's next book, The Architect, or Practical House Carpenter, published in 1830. This is a dramatic departure from the designs in the earlier book: Greek Revival in no uncertain terms! The chimney piece thrusts itself into the room. 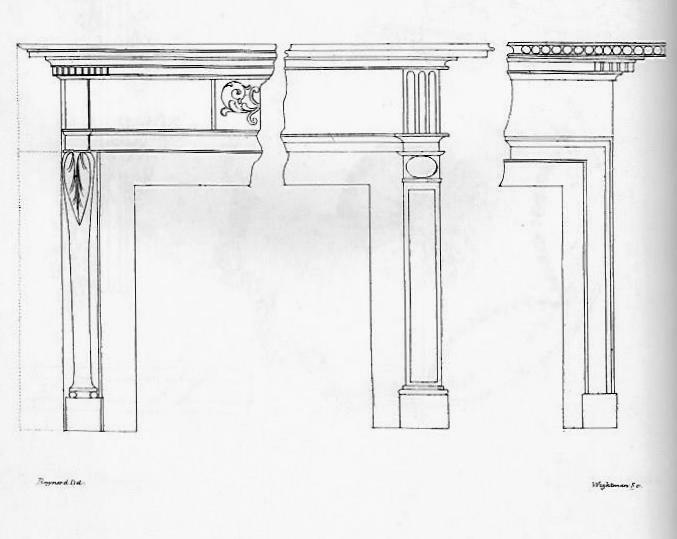 The side pieces are real columns set in front of the sides of the mantle. The shelf above has become an unadorned detail with no softening molding above that frieze with its bold, dramatic Greek Key. Here is the floor plan. 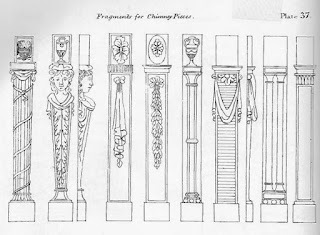 The columns are not just round, but fluted. The mantel shelf is thin, but wide and deep, adding to the sense of the fireplace jutting into the room. My friends' dining room is quiet - not like this! The farm house staircase is the second example. The newel shown here is elegant and flowing, a fitting ending to the rail and balusters. Not Greek Revival. Maybe tinged with Gothic Revival and Italianate sentiments, or inspired by Renaissance Revival furniture. 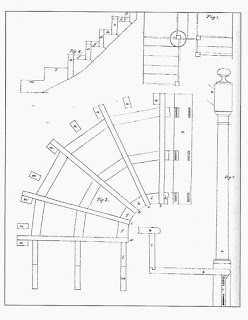 Below is Plate XLIII on stair construction from The American Builder's Companion. 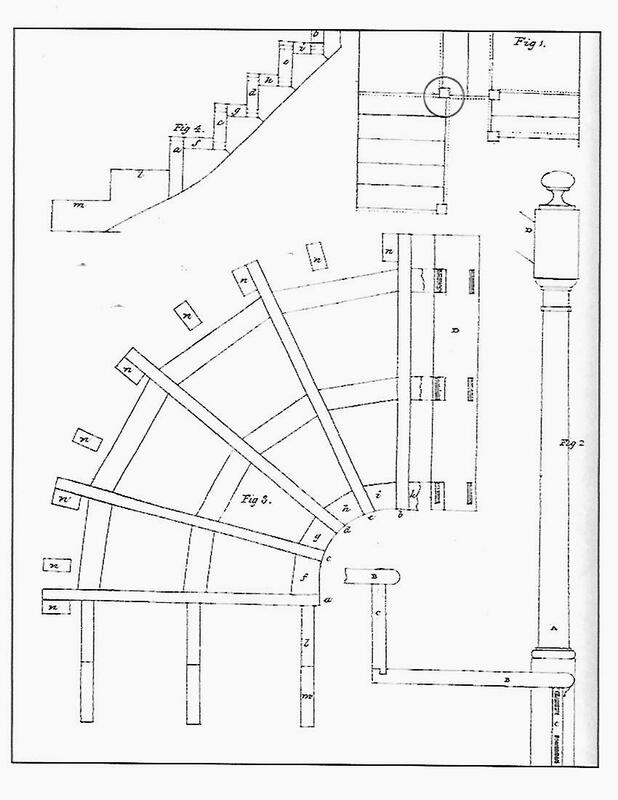 It includes practical drawings including diagrams for laying out curved stairs. 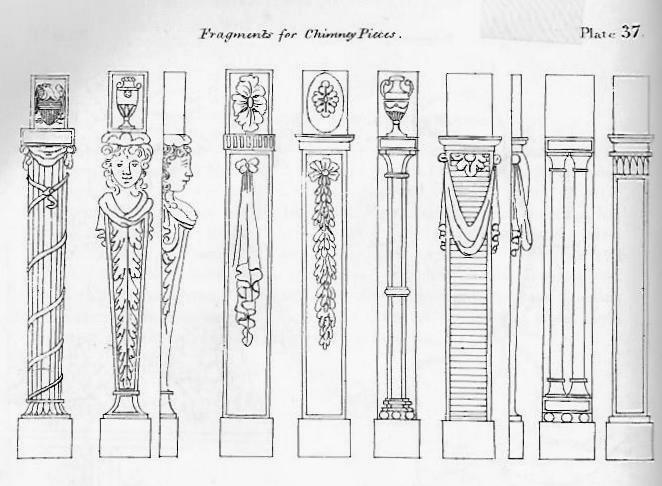 In the upper right is a careful drawing showing where to place newel posts on stair landings. I've added a circle to highlight that detail. 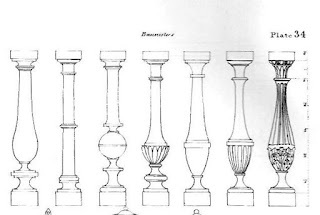 On the right side is drawn a newel post, a very plain newel that is securely anchored to the step, has a little entasis in the shaft, and ends with an elliptic knob that fits the hand. It comes from a different era than the one in the photograph. 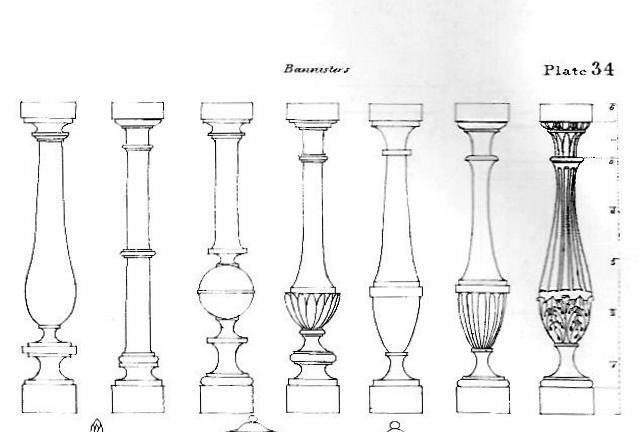 Below is part of Plate XXXIV from The American Builder's Companion, showing what Benjamin calls 'Banisters' and we now refer to as balusters. There is some relationship between these illustrations and those in the photograph - a solid base, a tapering of the shaft. but not much else. On the right side of the Plate a line is divided into 6 equal parts. The placement of the curves and ornamentation, the size of the base, is determined by those parts. The balusters in the photograph do not follow those proportions. If the rest of the house was built c.1810, then the newel and its balusters now in the house are later renovations. The final example is the hand rail, sinuous, beautiful. That smooth changing slope of wood was the goal of stair builders since the first awkward attempts in the 1750's. 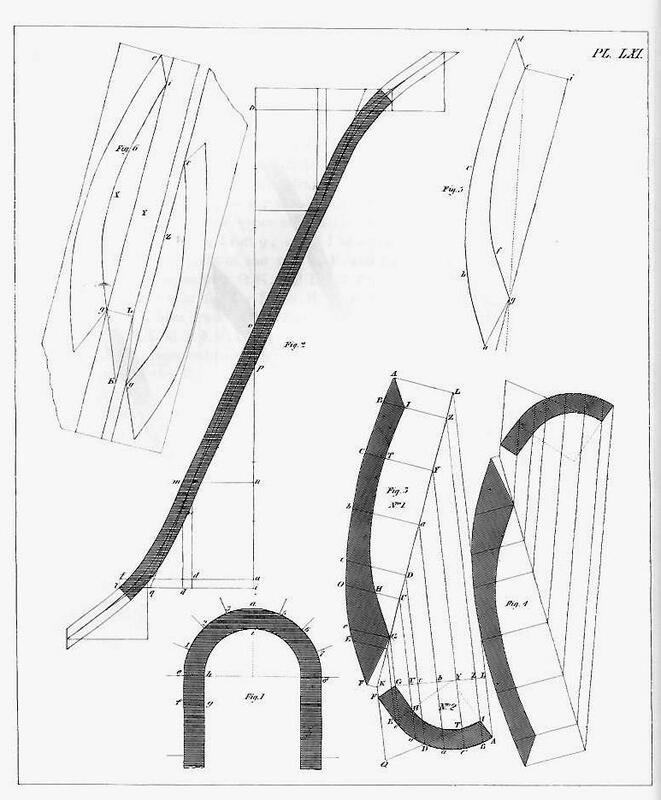 Benjamin dedicated 10 Plates and more than 15 pages of text in his 1806 and 1830 pattern books to the design and fabrication of that curve. This is highly technical, and hard to explain on paper with words. Benjamin does it so well that craftsmen today look to his directions. The railing does not fall at a consistent rate. Lumber is not necessarily curved to match the changes in direction; and yet, the aim is achieved: a smooth continuous flow of wood from the upper landing to the newel at the bottom step. 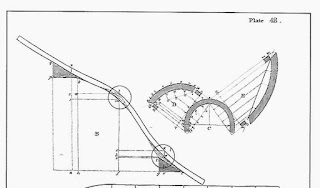 I have added circles on the smaller print - Plate 48 from The American Builder's Companion- to highlight where Benjamin said the curve was to be to be modified. 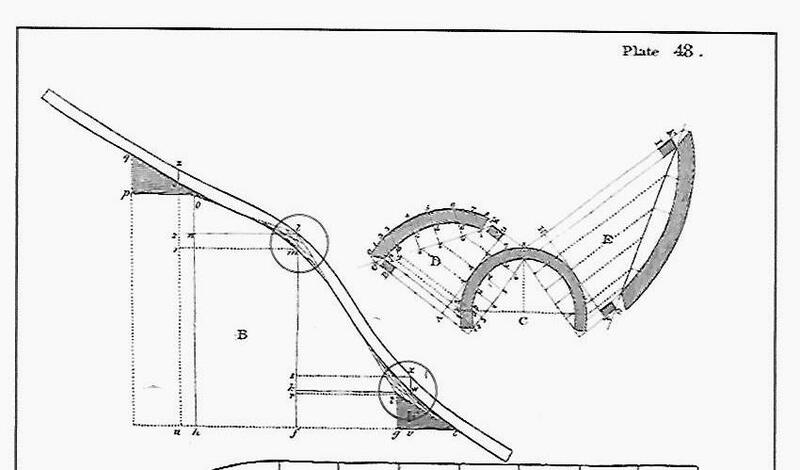 Plate LXI from The Architect, or Practical House Carpenter shows how "to find the moulds for a stair rail with a semi-circle of 8 winders." 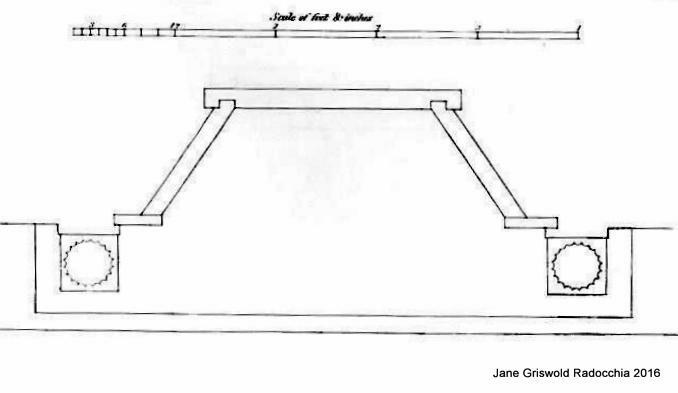 Figure 6, upper left, shows how to lay them out on a plank. The polished sloping hand rail invites us to run our hand along its length, and perhaps even to try sliding down around that curve! It is a beautiful work of art. *2 The Architect, or Practical House Carpenter, 1830, Third Edition, Preface, page v.